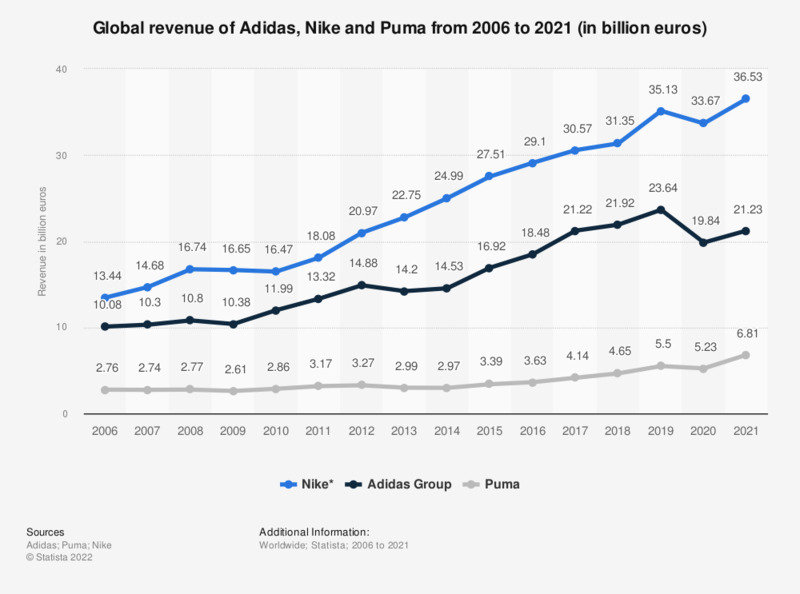 The statistic shows a revenue comparison of the sporting goods companies Nike, Adidas and Puma from 2006 to 2018. In 2018, the Adidas Group generated 21.9 billion euros in revenue. The global sports apparel market is highly fragmented, with basic discount brands to high-end fashion name brands competing for market position. U.S.-based Nike is the world’s leading brand in athletic footwear and apparel, and the most valuable sports business brand in the world. Nike has a higher global revenue than its main competitors, Adidas and Puma, put together. North America is a key market for Nike, as almost half of its global revenue was generated there in 2018, mainly from footwear sales. Much of Nike's success can be attributed to the brand’s marketing campaign as well as sponsorship agreements with celebrity athletes and professional sports teams. Adidas and Puma used to be one company named Gebrüder Dassler Schuhfabrik, established by two brothers, Adolf and Rudolf Dassler. After a disagreement between the two brothers, the company split, creating the two widely known sporting brands, Adidas and Puma. Adidas is the largest sportswear manufacturer in Europe, and the second largest in the world, just behind Nike, with over 21 billion euros in annual revenue and a brand value of approximately 16.7 billion U.S. dollars. Adidas employed 56,888 people worldwide in 2017. Just as with Nike, footwear is the most important category for Adidas. In 2018, over 50 percent of the Adidas Group net sales were generated by the footwear category. Puma, also a leading sporting brand in the world, has the long-term mission of becoming the most desirable sport lifestyle company in the world. Europe and the Americas are the most profitable markets for Puma, as these regions accounted for nearly 75 percent of Puma’s consolidated sales in 2018. Describing itself as the 'blue mountains', Puma has been trying to incorporate more edge, creativity and uniqueness into their designs with their collaborations with fashion designers such as Sergio Rossi and Alexander McQueen, and singer Rihanna. Collaboration with celebrities and fashion designers is a common strategy amongst these leading sports brands, as they aim to maintain their share of the market by broadening their product lines. ** Nike's financial year ends May 31st of each year. Revenue figures for Nike were converted from USD to Euros at an exchange rate of 1 USD - 0.8614 Euros (May 31, 2018). Puma's and Adidas's financial year ends December 31st of each year.